If you are a new patient, or are considering becoming a new patient, we are pleased to introduce you to Dr. Trey Kaliher, DDS. Dr. Kaliher received his undergraduate degree from Baylor University. Later, in the year 2000, he graduated with high honors from the University of Texas Dental Branch, located in Houston, TX. After graduation, Dr. Kaliher was accepted into the prestigious Dental Residency program within the US Air Force. It was there that he took part in an advanced level of training in virtually all dental specialties. Dr. Kaliher was awarded an Air Force Achievement Medal, recognizing his outstanding accomplishment in performing a life-saving resuscitation on a civilian while he was on duty. After he left the Air Force, Dr. Kaliher returned to the Austin area, along with his wife and his two daughters. 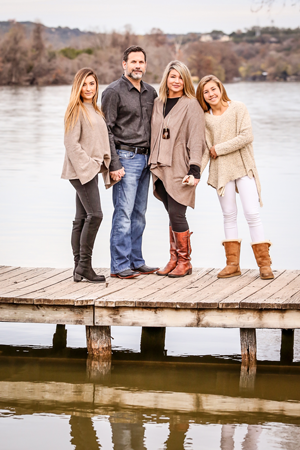 In addition to serving his patients here at Trey Kaliher General Dentistry, Dr. Kaliher enjoys spending time with his family and serving his community in whatever way possible. Currently, Dr. Kaliher is further expanding his professional expertise by earning accredited hours of study toward the Fellowship level in the Academy of General Dentistry. In addition to providing his patients with the highest level of dental services possible, Dr. Kaliher is dedicated to treating each individual patient with honesty, integrity and professional excellence. At Trey Kaliher General Dentistry, we are pleased to provide our Austin, TX area patients with a wide range of services to meet virtually all of their dental needs. We welcome all ages of patients – from the youngest to the most elderly. We look forward to welcoming your family to our own patient family here in Austin!